Our market leading self-inflating sandbag which has our UK Patented center stitch, which is essential to make the bags fit for purpose. 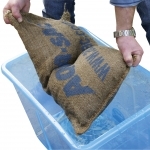 Aqua-Sac® is a proven alternative to traditional sand bags for flood defence. 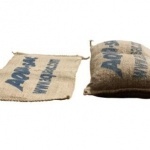 Comprising of a heavy duty Jute sack and a cotton liner with our Patented center stitch. 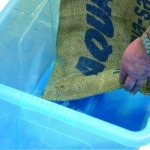 Containing a Super-Absorbent Polymer the Aqua-Sac® is simply submerged in water. After five minutes 13 litres of water will have been absorbed creating an inflated “sandbag”. Inflated Aqua-Sac® S.O.S. Bags are 54cm long and 10cm high. Each Aqua-Sac® is of a consistent size enabling a barrier to protect against flooding or diverting water to be built easily. 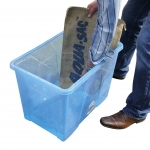 At 13kg an Aqua-Sac® is significantly lighter than traditional sandbags and so reducing manual handling risks. At 440g Aqua-Sac® can be transported in higher volume to where they are required in an emergency in smaller, more efficient vehicles. Aqua-Sac® are compact, 1000 can be stored on one standard pallet saving valuable storage space compared to only 25 traditional sandbags. Aqua-Sac® are contained in sealed packs giving a shelf life in excess of five years and so reducing waste. The Jute sack and cotton liner are biodegradable. The super absorbent polymer is benign with no toxic effects. Aqua-Sac® can be disposed of safely in landfill or by incineration. Alternatively, the super absorbent polymer may be added directly to soil as a hydrating medium. Aqua-Sac® will begin to dry out over the course of six to eight weeks. At any point they can be re-inflated providing that they have not been contaminated.